Today through August 31th, 2018 all of my retired Stampin' Up! products, except stamps and tools, are 15% off the sale price. The products included in this 15% off sale are all accessories, trims and embellishments, ink pad, ink cartridges, ink refills, markers, papers of all types, adhesives, kits, etc. I must have your wish list by August 31st. Payment will be due within 1 week from invoicing. Click on the retired graphic or the links below to view my retired Stampin' Up! products inventory lists. All Embellishments: Ribbons, Trims, Buttons, Brads, etc. Click here to see ALL of my retired products. All inventory lists are current. So far, I only have a few items set aside for someone. But send me your wish list ASAP, or you may not get what you want. First come, first served. I need the item # and the description to insure I know precisely what you're seeking from my inventory. Include your USA zip code so I can accurately calculate shipping from me to you. To look up retired products in the catalog they were last featured, click here. Questions? Feel free to contact me at the above e-address. 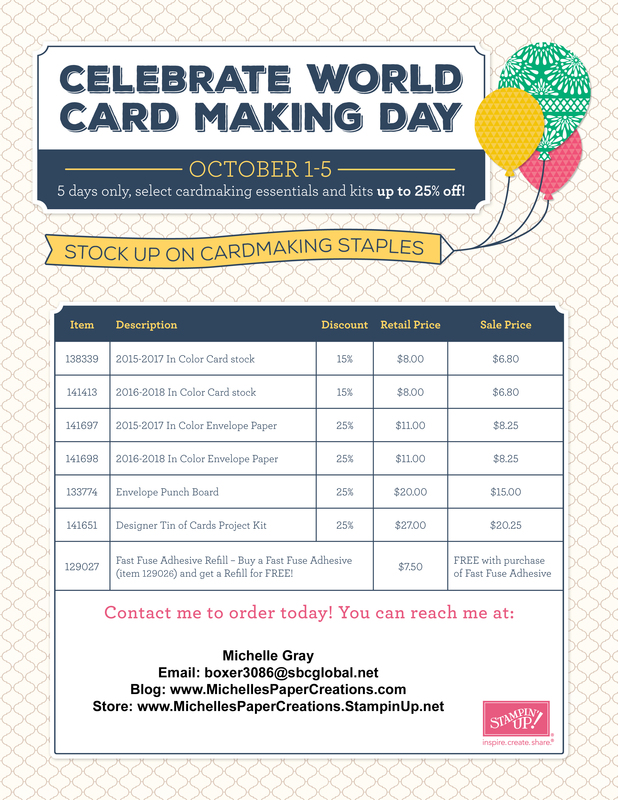 As you probably know, Project Life originated to simplify scrapbooking, but the kits are also great for quick cards. All the papers coordinate so well that it's almost a no-brainer to put them together. And the exclusive Stampin' Up! Project Life kits coordinate with the exclusive Stampin' Up! color groups. The Sale-a-bration kit, "This Day" Mini Card Collection, is no exception. It was so much fun making 16 cards with this kit. I mostly used 3 of the 2014-2016 In Colors, but I used 3 other colors too. In additon I used bits from "Tag A Bag Accessory" kit and the SAB ribbon and button collections to add some finishing touches. Below the pictures, I've also listed everything I used to make these cards. I usually use the clear mount stamp sets, but I've included links for the wood mount and the photopolymer versions so you can select your preference. You won't see in the photos, but I stamped the back using the Memento pad and "Better Than E-Mail" from the set of the same name. All 16 cards, 16 envelopes and 16 cello sleeves are going to be given away as a door prize. You can enter the drawing by coming the my table at the Craft Stars event on March 28th and signing up on my mailing list. Click on the flier to enlarge it. And remember, some of the products I used were FREE gifts with a $50 purchase during Sale-a-bration. SAB ends March 31st, so don't delay in placing your order to get your FREE stamps, papers or trims.